Danish tenor singer; born Oct. 29, 1839, at Sorö, Zealand. In 1860 he sang in the chorus of the Royal Theater, Copenhagen, where he received instruction from H. Rung. He subsequently appeared at several concerts, and had just, received his first rôle in "The Hunter's Bride" ("Jægerbruden") at the Royal Theater, when the war between Denmark and Germany broke out (1864) and he was called to serve in the army. Upon his return in 1865 he gave a concert which procured for him the means for a year's study under Lamperti in Milan. In 1866 he received an engagement at Folketheatret in Copenhagen, where he remained as a soloist until 1873, when he decided to devote his whole time to giving instruction in singing. He wrote "Theoretisk-Praktisk Sangskole," which presents a theoretical-practical singing method based upon physiological studies of the human voice, and which appeared in Copenhagen, 1874, with a preface by Professor Panum. 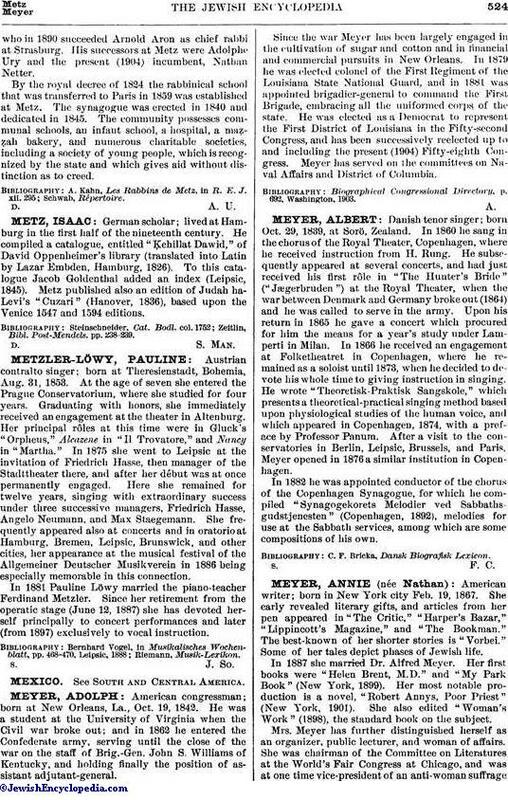 After a visit to the conservatories in Berlin, Leipsic, Brussels, and Paris, Meyer opened in 1876 a similar institution in Copenhagen. In 1882 he was appointed conductor of the chorus of the Copenhagen Synagogue, for which he compiled "Synagogekorets Melodier ved Sabbathsgudstjenesten" (Copenhagen, 1892), melodies for use at the Sabbath services, among which are some compositions of his own.